We’re continuing our Russian online cocktail party. The 26th of November is the date of the second event, and Sidecar is the theme for it. 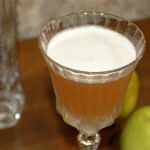 Sidecar, a cocktail legend. Its roots are in the beginning of last century. I have no intention to seek for stories about the men who invented Sidecar. I’m going to learn how vintage recipe will work now and find my own perfect recipe. I have had my first Sidecar experience when I was newbie in cocktail culture (I mean «more newbie than now»). I’ve red a nice article about Sidecar then took equal parts of awful Russian brandy, Cointreau and lemon juice and eventually got teeth-damaging acid liquid impossible for drinking. Next attempts were more successful. I’m used to buying good French Cognacs, I’ve learned that Sidecar proportions can be changed. So my Sidecars became better and better. 2 dash rock candy syrup. 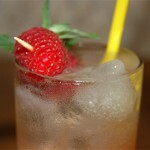 Shake with ice and strain into wine glass. This version brings fresh citrusy flavour in the sip, a little tart but pleasant though. On the swallow Armagnac comes from the background with its robust oak and fruity notes but it can’t compete with lemon and Cointreau and eventually finds itself forced out to the back. Well-balanced acidity gives this Sidecar version light and clear taste but I can’t say that I was fully satisfied in the case if brandy part equals sum of the lemon and Cointreau parts. That turns Sidecar to citrusy cocktail with brandy ended up at the background. 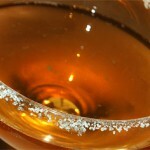 But I love Cognac’s aroma and want to underline it in my Sidecar. 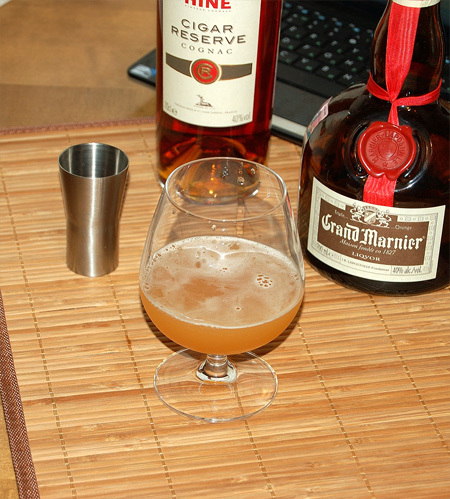 So I selected nice aged Cognac as brandy and substituted Cognac-based Grand Marnier for Cointreau. Shake with ice and strain into snifter. Oh my God, that a drink! Totally based on Cognac, it’s full of delicious wood, vanilla, tobacco, chocolate, and orange candied peels. Dry oak and tart lemon zest works together in aftertaste. Right or wrong,, I’ve got eventually that I wanted: Sidecar with strong Cognac profile and subtle citrus background. Full-bodied and rich, with smooth mouthfeel, this Sidecar is a real pleasure. Here I could finish my story but I have two more Sidecar cocktails to write about. 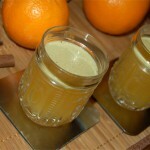 That’s not classic ones: version with Calvados and Audrey Saunders’ Tantris Sidecar. 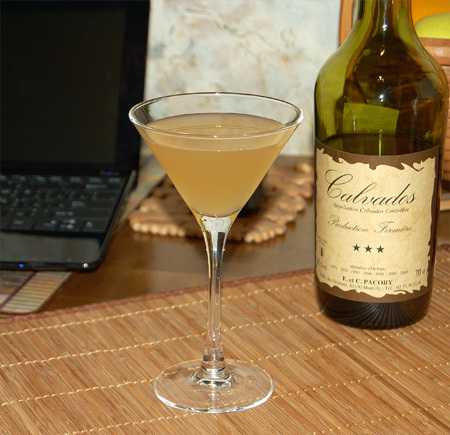 Calvados Sidecar looks like smoother Jack Rose variation. Please trust me, it’s much better. 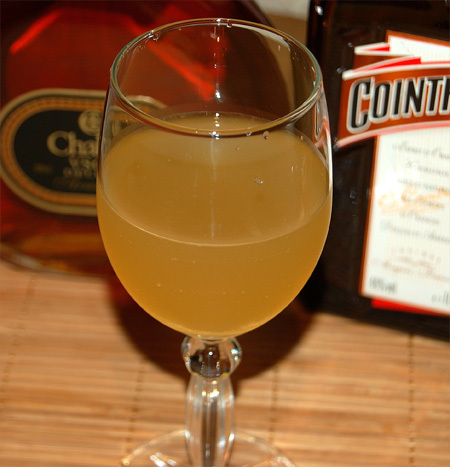 Calvados Sidecar starts with sweet apple and light seeds’ bitterness. Weak orange notes appear on the palate adding a little freshness to apples. In the aftertaste lemon zest’s dry hints bring more tartness but later candied apples, oak and cider works together to create very pleasant finish. 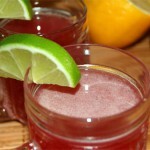 Nice cocktail – well-balanced, easy to drink, strong and full-bodied. The last try was Tantris Sidecar, a work by Audrey Saunders whose Smokin’ Martini is one of my favorite drinks for a long time. I slightly adapted the recipe substituting small amount pineapple-flavoured vodka for pineapple juice (here in Moscow I can buy only awful over-sweetened and tasteless pineapple juice). I was a little skeptical when making the cocktail and tirelessly pouring spirits from all these six bottles. But all my doubts disappear when I sipped this mysterious drink. It’s quite breathtaking cocktail. Tantris Sidecar brought waves of flaours down to me adding more and more nuances to its magnificent aroma. I’ve remembered strong sweet Calvados combining with anise and other herbal notes of Chartreuse along with Cognac and Cointreau pair bringing orange, spice and wood notes. Van Gogh pineapple vodka operated in the aftertaste with its sweet and tart hint of pineapple marmalade. Delicious, festive, attractive, admirable! Definitely it’s worth the time I spent handling that huge amount of components.